California Endowment: Central Valley Mural Project - SPARCinLA We are SPARC: Art | Community | Education | Social Justice SPARC | Social & Public Art Resource Center | Creating Sites of Public Memory Since 1976 | Founded by Judy Baca, Donna Deitch & Christina Schlesinger | SPARC is a community cultural center that creates public art as a vehicle to promote civic dialogue, foster cross-cultural understanding, and address critical social issues. We accomplish our mission by producing, preserving and presenting community-based public art. SPARC is a facilitator Ð finding ways to tell richly textured stories that help community participants and artists achieve a measure of change and transformation. Last Fall (2018), SPARC began the installation of eight murals throughout the Central Valley on health, wellness and social justice in immigrant and agricultural communities. Sponsored by the California Endowment, the SPARC team will be completing murals in Bakersfield, Lamont, Merced, Fresno, Armona, Tulare, Modesto, and Stockton. Partners include the United Farm Workers, ACT for Women and Girls, the Dolores Huerta Foundation, El Centro Binacional para el Desarrollo Indígena Oaxaqueño, El Concilio, Community Medical Centers-Stockton, We’Ced, and the Kings County Cultural Center. 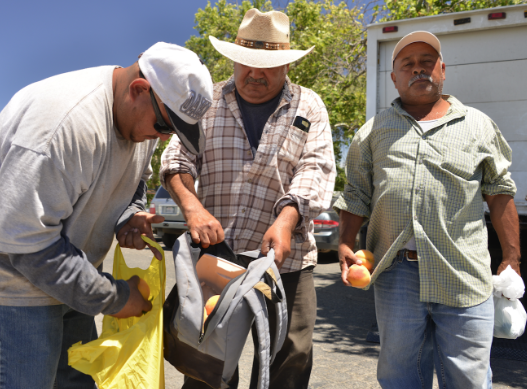 Pictured above is Planada Peach Picker Miguel Jr. (far left) sharing his knowledge of the challenges his peers face, the dignity of immigrant farm workers, and aspirations for their community.